This 2015 No-Fault PDR Titanium Heater is the newest factory upgrade replacement heater from the makers of Hot Springs spas. Its double-pass sleek design replaces all previously discontinued heater styles. The double-pass feature efficiently heats the water in two stages and oh what a perfect job it does! Now factory approved and warrantied for all 115 volt 1.5kW and 230 volt - 6kW installations for all 1995-now Hot Springs and Tiger River spa models. For 4kW, 230 volt applications see the 73791 PDR. 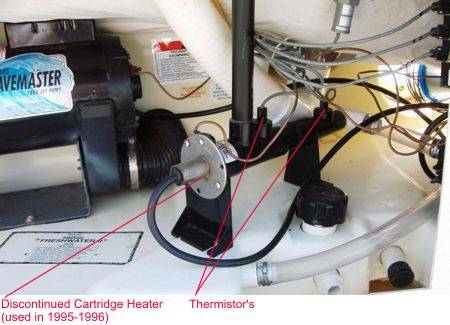 Your existing 3/4" vinyl tubing will attach to this heater with no worries. The thermistors have different thread sizes to insure they can't accidentally be reversed when re-installing them into this new PDR heater. 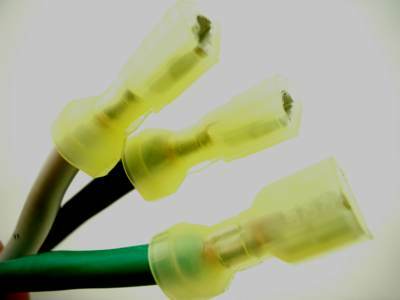 They also have different tips on the ends of the wire to insure they can't accidentally be plugged into the wrong port on the IQ Control Box. This replacement heater doesn't have a plug on the end of the power cord like on the 1995-1996 spas. In most applications, the heater is connected directly inside the spas control box. If your existing heater plugs in to the bottom of your control box, you may need the appropriate adapter. Adapters are listed next to your spa model on the chart below. Note: The 73791 can be used as an alternative to this heater in a spa that's wired 230 volts. Some service techs prefer the 4kW PDR to this 6 kW siting that it puts less strain on old/weakening 30 amp GFCI breakers. Tip: You can also utilize the cord end (plug) from your old No Fault heater and splice it onto a PDR if needed. Note#1: This PDR (power-down-reset) heater eliminates the manual reset button, which means that you never need to remove the equipment door to reset the heater. Simply power down the spa for 30 seconds by either tripping off the GFCI breakers in the sub panel (on 230volt models) or unplugging the spa (115volt models). Yay for this massive improvement! There is something about the manual reset circuitry on heaters that causes them to expire prematurely. This heater replaces all heaters in all 1995-now Hot Spring, Tiger River and Limelight hot tubs which includes the No Fault 6000 heaters, Watkins No Fault 5500 and the No-Fault 1500 cartridge style heater. Note#2:The inlet thermistor port on these style heaters may require a wrench to thread in the thermistor. Replacement Hint: It's easier to replace a heater if the spa is drained. 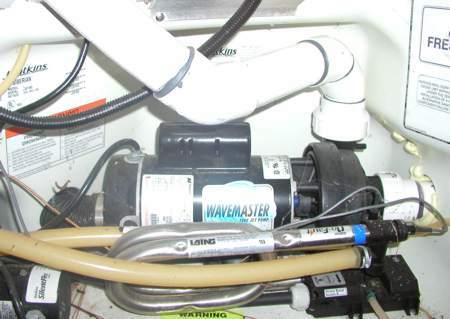 However, some folks leave the water in the spa, disconnect the vinyl tubing from their old heater and insert wine corks into the ends of the vinyl tubing. This insures a minimal amount of water loss during the change out. Clever repair techs use radiator hose pinch off pliers to clamp off the tubing. 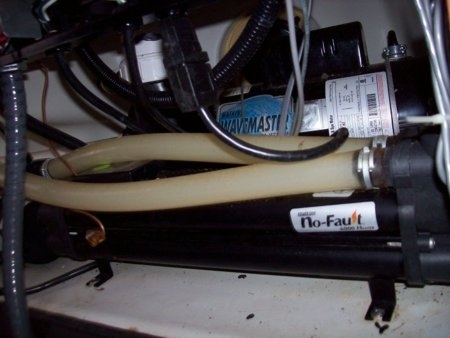 Use this kit if you're replacing your original No-Fault® 5500 or No Fault 1500 Cartridge Style heater on a 1995-1996 Hot Spring or Tiger River spa. Click the "More Info" button for details. This heater cord adapter may be needed when replacing a No-Fault 1500 cartridge heater with a new PDR Heater Assembly in a 1995-1996 Hot Spring 15volt spa model. This adapter is attached to the end of the new PDR heater's power cord to enable it to plug into your spa's control box. A Heater Retrofit Kit may also be required. This heater cord adapter may be needed when replacing a No-Fault 1500 cartridge heater with a new PDR Heater Assembly in a 1995-1996 Tiger River Manora or Tondi spa model. This adapter is attached to the end of the new PDR heater's power cord to enable it to plug into your spa's control box. A Heater Retrofit Kit may also be required. This heater cord adapter may be needed when replacing a No-Fault 5500 cartridge heater with a new PDR Heater Assembly in a 1995-1996 Hot Spring 230volt wired spa model. This adapter is attached to the end of the new PDR heater's power cord to enable it to plug into your spa's control box. A Heater Retrofit Kit may also be required. This heater cord adapter may be needed when replacing a No-Fault 5500 cartridge heater with a new PDR Heater Assembly in a 1995-1996 Tiger River 230volt wired spa model. This adapter is attached to the end of the new PDR heater's power cord to enable it to plug into your spa's control box. A Heater Retrofit Kit may also be required. This jumper is used to bypass the pressure switch on the 2002-forward IQ 2020 control box. The PDR Titanium Replacement Heater has its own automatic cut-off in the event of a low flow condition thus negating the need for a pressure switch. After installing the PDR heater simply plug this bypass jumper into the port on the IQ 2020 Control Box that's marked "Pressure Switch". That's it! 3/4" spring clamp (aka wire clamp) is used to secure the 3/4 inch vinyl tubing (70315) to various components. Note: Wear eye protection when squeezing these little rascals. Service techs typically use either needle nose pliers or hose clamp pliers to squeeze then slide this spring clamp onto the vinyl tubing. This control thermostat thermistor sensor detects the spa waters temperature and relays that information back to the system. It simply screws into the No Fault Heater Housing (hand tight only) and plugs into the outside of the spa's control box. If your existing thermistor plugs directly onto the main circuit board (motherboard) inside the IQ2020 control box, then use item 39205. Always replace thermistors in pairs ( ie; 38415 & 38416 ). Click the "More Info" button for details. Newly designed. This control thermostat thermistor is a safety device designed to communicate with the system to shut down the heater if the water temperature exiting your heater exceeds 118 degrees F. It simply screws into the No Fault Heater Housing (hand tight only) and then plugs directly onto the motherboard inside the IQ 2020 control box. 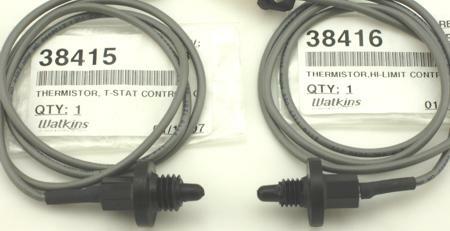 (If your existing thermistor plugs into the outside of the spa's control box see item 38415). Always replace thermistors in pairs (ie; 39204 & 39205 ). Click the "More Info" button for details. Click the "More Info" button for details. This high-limit thermistor sensor is a safety device designed to communicate with the system to shut down the heater if the water temperature exiting your heater exceeds 118 degrees F. It simply screws into the No Fault Heater Housing (hand tight only) and then plugs into the outside of the spa's control box. If your existing thermistor plugs directly onto the main circuit board (motherboard) inside the IQ2020 control box, then use item 39204. Always replace thermistors in pairs (ie; 38415 & 38416). Click the "More Info" button for details. *Temporarily on back order with the factory, limited inventory as of 5/29/2018. Please use 39525 as a replacement for now. Newly designed. This high-limit thermistor sensor is a safety device designed to communicate with the system to shut down the heater if the water temperature exiting your heater exceeds 118 degrees F. It simply screws into the No Fault Heater Housing (hand tight only) and then plugs directly onto the motherboard inside the IQ 2020 control box. 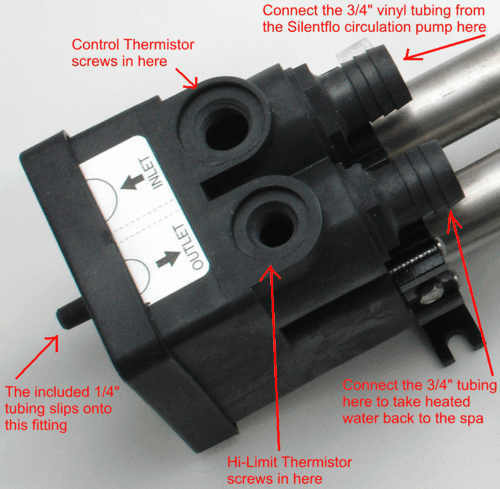 (If your existing thermistor plugs into the side of the spa's control box see item 38416). Always replace thermistors in pairs (ie; 39204 & 39205 ). Click the "More Info" button for details.